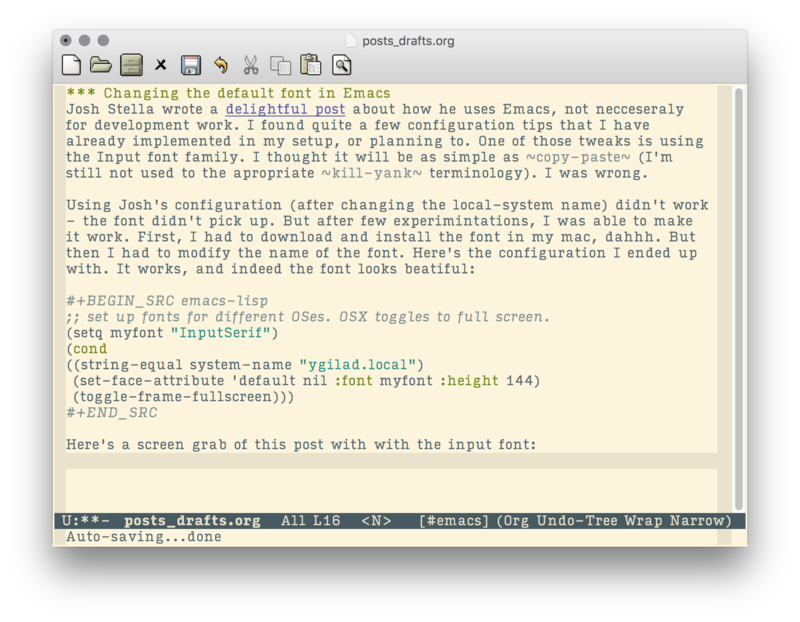 Josh Stella wrote a delightful post about how he uses Emacs, not necessarily for development work. I found quite a few configuration tips, and already implemented few of them. One of those tweaks is using the Input font family. Visiting fontbureau made me want this font too! I thought it will be as simple as copy-paste (I'm still not used to the appropriate kill-yank terminology) Josh's configuration. It wasn't - after reloading my init, the font didn't pick up. ;; set up fonts for different OSes. OSX toggles to full screen. There's still one problem - this modification to my config broke the org-reader plugin, and I can't export my org files to Pelican. Sadly, I'll have to resort to the default font (Menlo), until I figure out a fix.